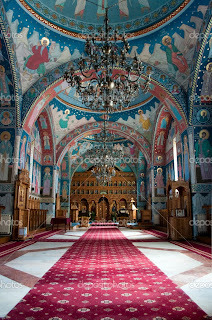 Today’s post looks at religion in Transylvania, Romania. Many religions are practised throughout Transylvania today. 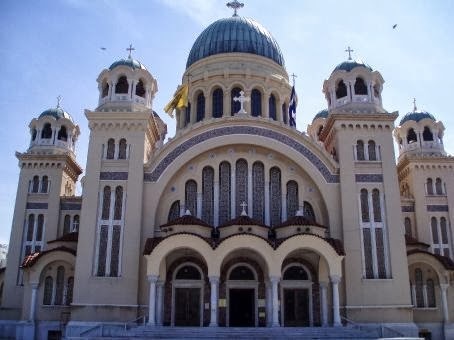 The one most commonly practised by Romanians is Eastern Orthodox Christianity, and throughout this post I will discuss some of the history of the Eastern Orthodox Church. The Eastern Orthodox Church is a branch of the Christian Church. There were some major disagreements, both political and about doctrine, within the Christian Church during the Middle Ages. The religious issues resolved around the use of icons, the idea of the Holy Spirit being divine or not, and on which date the church should celebrate Easter. To some people, these issues may seem to be minor, but to the Medieval Christian Church these were huge issues. Political divisions grew along the lines of how the Eastern churches and Western churches were run. The East thinkers tend to be more abstract and mystical thinkers while the Western thinkers give more weight to logic and law. The split between the two parts of the Church was major and public. History has named it the Great Schism. 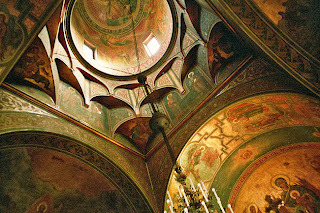 The Eastern Orthodox Church has some beliefs that are specific to them. The Church sees humanity as being able to fully participate in the divinity. To them sin came when the image of God was blurred and there was a barrier put up between man and God. The way in which Eastern Orthodox Christians gain salvation is much different than those of Western Christians. They do not see it necessary to justify the sin or gain pardon, they are more concerned with re-establishing the connection with God and the divinity. There is also the difference in how the Eastern Orthodox see Christ and divinity. They put more emphasis on the fact that Christ was always divine. They do agree that Christ became human, that he was the bridge between God and humanity. They also hold the Holy Spirit in a much higher standing in the East then in the West. The Eastern Orthodox will usually open with a prayer to the Holy Spirit. The fact that one of the main religions in Transylvania is greatly influenced by abstract thinking and mysticism is something I found interesting. It is still a Christian religion, but one that still believes in the mystical part of the world. Being in Transylvania, home of Dracula and vampires, I think it kind of makes sense. They are also quite close to Bucharest, Romania, home of the werewolf. It appears to me that Eastern Orthodox gives the people of Transylvania the best of both worlds. They are able to believe in God and were able to go to heaven. They are also able to continue honouring their past and traditional beliefs. In the readings that I have done I have seen that history and traditions are important to Transylvania.